Society fixates on immediate gratification and as such financial tools such as credit cards, personal loans and store cards have become catalysts for loans becoming debts. Increasing numbers of people are bearing the burden of living beyond their means. It is overwhelming, but the best response you can have is to deal with the issues immediately. However, it is well advised to seek independent and professional guidance before choosing any financial services. Many people live by guides, ideas or mental calculations of their income and expenses without spending the time to really go over the numbers. This is risky as it is easy to miss vital financial responsibilities and payments. 1. Get a small notebook to record your expenses, use it to add up your totals and also cross-reference it against your monthly bank statements. 2. Microsoft Office Excel has the ability to create very effective financial spreadsheets to show you not only where your money is going, but what categories are your biggest money wasters. 3. Smart phone users are a step ahead as they have access to a number of great finance focussed apps. Try the 99c ‘My Budget Planner’ for a way to categorise not only all of your income pathways, but your expenditures too. For a free option give ‘iSpending’ a go it has a comprehensive list of ways to input your expenses and display them as daily, weekly or monthly lists. It is difficult to face your debts and their consequences head on, but it is imperative that you do. Seek assistance from a counselling service like ‘Lifeline’, ask a friend to sit with you or request advice from a relative before you open up your fiscal Pandora’s box. Pull off the wool (from your eyes) and look at your financial situation clearly. 1.Make a list of everything you owe. From banks to friends, whatever the source for bad credit own up to it. 2.Prioritise your debts in order of importance. All debts need acknowledging and your commitment to payment, but some debts are going to be more consequential than others. When it comes to debt you must learn your legal rights. There is always a chance that your creditors will take all options at their disposal to obtain their money. However, it is important that you are aware of what steps you should take to ensure that legal action never becomes an issue. 1. Aim to keep paying the minimum repayment on all of your loans. 2. Find the priority loan with the highest interest rate and make that your priority for any additional funds you can divert to paying off your debt. 3. Contact your credit source, whether is it a bank, utility business or store owner. Discuss your financial issues and establish a repayment plan you both feel comfortable with. 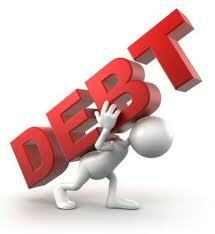 Quite simply put you must take small but educated measures to reduce your debt. There are many services available to help you from both an emotional and financial perspective. www.smartmoney.gov.au has a comprehensive list of financial counselling services you can use. It also has a list of legal services at your disposal if the consequences of your debts become overwhelming. Damian is an online entrepreneur and marketing specialist. Currently, he works on marketing strategy for Debt Helpline online project.